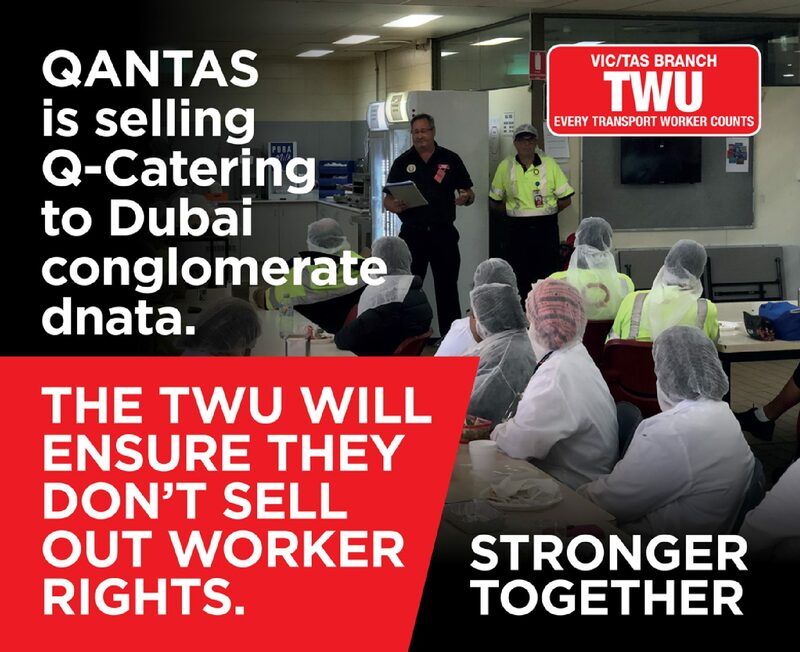 TWU (VIC/TAS Branch) Secretary John Berger today met with distressed Q-Catering members following Qantas Airways’ announcement that it intends to sell its catering division to dnata – part of the powerful, Dubai-headquartered, Emirates Group. John, along with Aviation Organiser Dissio Markos, addressed members at the company’s Melbourne Airport base who are rightfully concerned about how the sale will impact on their employment and entitlements, such as staff travel, and conditions. John, Dissio and Q-Catering Delegates were part of a TWU delegation that met with Qantas management yesterday – the union emerged with the message that it would fight tooth-and-nail to ensure no members are disadvantaged through the transition. “It is never nice when these sorts of announcements are made and they obviously cause a lot of stress and pain for our members and their families. Rest assured the TWU will be doing everything in its power to protect our many Q-Catering members – some of whom have been with Q-Catering for decades,” John said. “We will fight to ensure they do not lose any existing pay and conditions – if the sale proceeds and there is a transfer – and that they have job security now and into the future. The mooted sale still requires the endorsement of national competition regulator the Australian Competition and Consumer Commission (ACCC) – Q-Catering currently employs about 1200 staff. Following today’s meeting many non-TWU Q-Catering workers applied to join the union. Q-Catering workers are doubly-concerned by the sale as, two months ago, dnata announced it would be making redundancies. However, TWU-intervention, led by John Berger, has been able to cut the number of expected redundancies and ensured casual positions – and not full-time workers – would be the first to go. Negotiations continue. In a short statement to staff on Wednesday, Qantas Airways advised employees in Melbourne, Sydney, Brisbane and Perth that it had agreed to the sale under which Q-Catering and Snap Fresh will become part of the dnata operation. The suggested initial contractual period is 10-years. 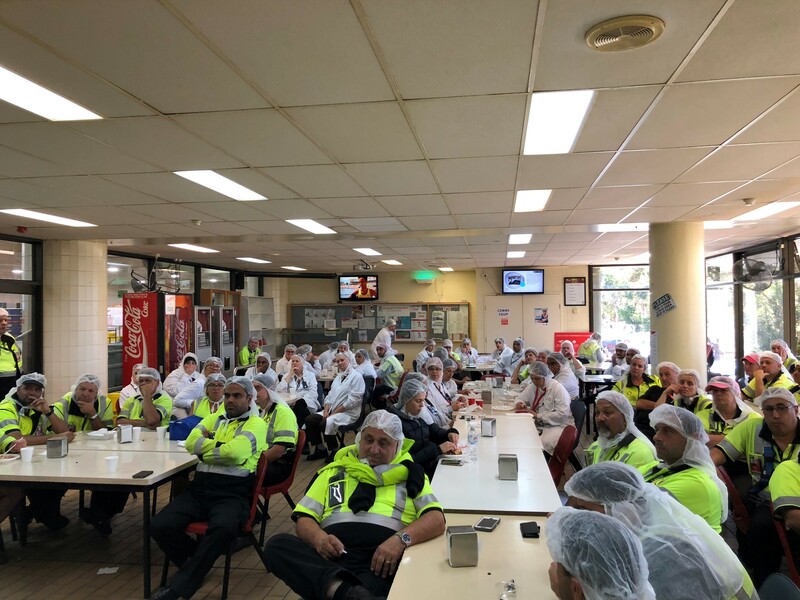 Dnata already operates 11 catering facilities in Australia (recently rebranded from Alpha Flight Services) and serves more than 320,000 meals a day. The TWU activity woke up non-members at dnata who have been signing up in large numbers since February’s announcement. The TWU will provide updates to members as soon as they come to hand. STRONGER – TOGETHER. Fight for your future and support your mates – join today.